This is an ecourse to take wherever you live, in the comfort of your own home. 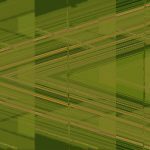 It is for quilters used to using a computer, who want to try something new or are looking for inspiration. You will know how to use your computer and you will need Photoshop installed for some of the blocks. For others you need a drawing program. The work is drawing on a computer, creating colour combinations, creating a series of mix and match blocks using geometric shapes and options for how to print them. 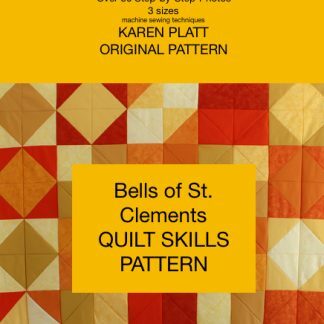 It is ideal for all levels of quilters, even beginners and includes ideas that you can adapt to make your own personal quilt. We will be working creatively, so you should be able to take each block as a starting point for you to create many more ideas. The potential is only limited by your imagination. Each month, you will receive an email with instructions that give a starting point for your own design. Tutor guidance and access is given throughout – although it is limited to 30 mins per month. You will also be able to upload work from the course onto a special closed fb page – where we will discuss work. You will receive notes, guidance, a mini booklet with monthly instructions to keep for future reference. 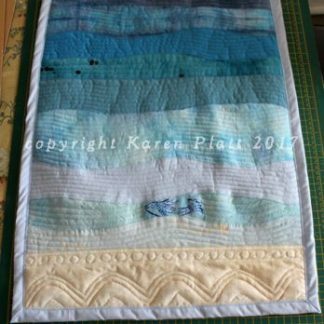 The aim of the course is to create and design your own quilt blocks using a computer and to print them out and stitch. 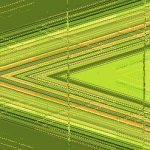 You are designing each block. This is not a set block that you copy. 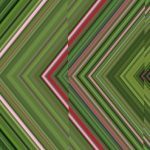 You have the option to be able to design numerous blocks from this ecourse and make many quilts. The ecourse runs from 10 September each year to end of June, that’s 9 blocks with infinite variations. Payment is taken before you begin, the price is for the full 9 months. 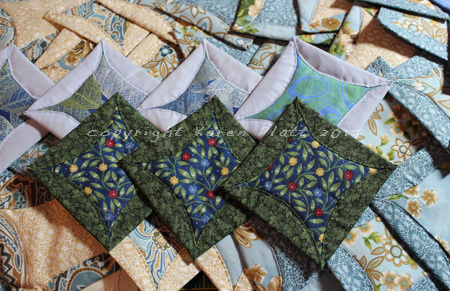 If you join after September, the quilt blocks are sent in one go up to the date when you join, then monthly thereafter. You can also opt for a one-month taster – this is 20 pounds for one block. Please email with the subject Quilt Block design taster. Once you have paid, you will receive an acknowledgement email. Whenever you sign up, please remember that the ecourse begins in September. There are no delivery costs and the course is delivered to your email wherever you live. N.B. All information in this ecourse is copyright Karen Platt 2018. Photographs and this ecourse supplied are copyright Karen Platt 2017. You can use your own blocks that you create as you wish. Payment is non-refundable even if you do not create work or leave the course early. No fabrics or other materials are supplied, this is a digital quilt block design ecourse. You might also like to look at my ecourse on fabric design that will extend your repertoire even more.